Halton Borough Council released footage capturing the end of the remediation works at Catalyst Trade Park, which was supervised by Ramboll’s Peter Fitch, and forms part of the wider Mersey Gateway project. Peter Fitch, Ramboll, supervisor on the Mersey Gateway remediation contract speaking on Halton Borough Council's video about the end of the remediation works at Catalyst Trade Park. The film is available to view at the Mersey Gateway website and was created by DTW, Halton Borough Council’s PR consultant. Its release coincided with the contract completion date, when Ramboll received confirmation from the Environment Agency and Halton Borough Council that they were satisfied that the objectives of the remediation works had been achieved. The video was filmed when remediation works at Catalyst Trade Park were switched off, having successfully recovered almost 17 tonnes of chlorinated solvent contamination from beneath the ground. We invited representatives from Halton Borough Council, including the Chief Executive and the Leader of the Council, to mark this achievement and show how the site was prepared for construction works to commence in the coming months. Phil Studds was Project Manager for the remediation contract, and Peter Fitch acted as the Supervisor. 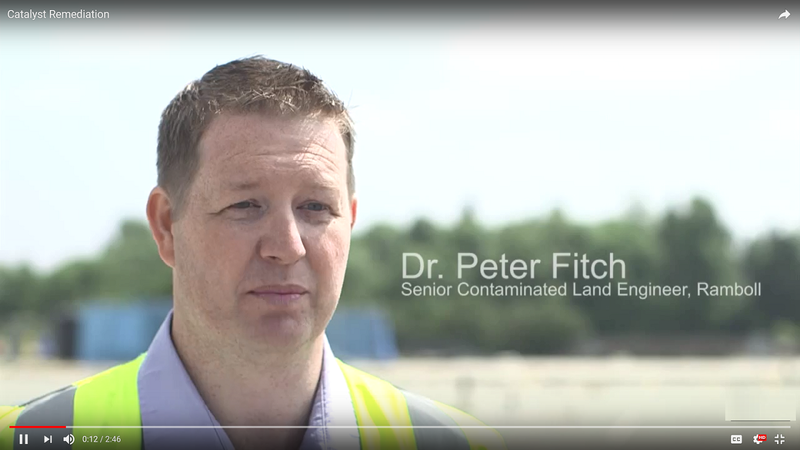 Peter was onsite full-time during the remediation works, which took 13 months to complete. Ramboll is now undertaking an investigation into groundwater quality outside Catalyst Trade Park on behalf of the Council in addition to undertaking further assessment of Bowers Brook, a culverted watercourse that flows through the Project area. The remediation contract and investigations were part of a programme of advance works undertaken by the Council to mitigate risk to the main Mersey Gateway DBFO contract, with Ramboll acting as the client’s lead Technical Advisor.